A toy car could easily break the sound barrier—or go even faster—in a kid's spirited imagination. But back in reality it takes more than that. 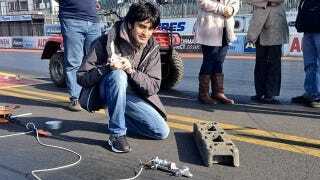 You need engineering, patience, and a handful of rocket model engines—all of which helped Samvir Thandi's SST-3B-Falcon rocket hit a top speed of 287.59 mph. That was fast enough to set a new world record for model rocket cars, besting the previous record from last year by a whopping 84 mph. And that speed was actually just the average of two runs which is how the record is officially determined. On one run the small car actually hit 344 mph. Of course at those speeds the car is basically just a missile with wheels, and is completely uncontrollable. Which is why on one run it nearly obliterated a set of timing gates.